Posted December 22, 2012 by Tom Gilmore & Ray Ryan, the Tuam Herald in Features. 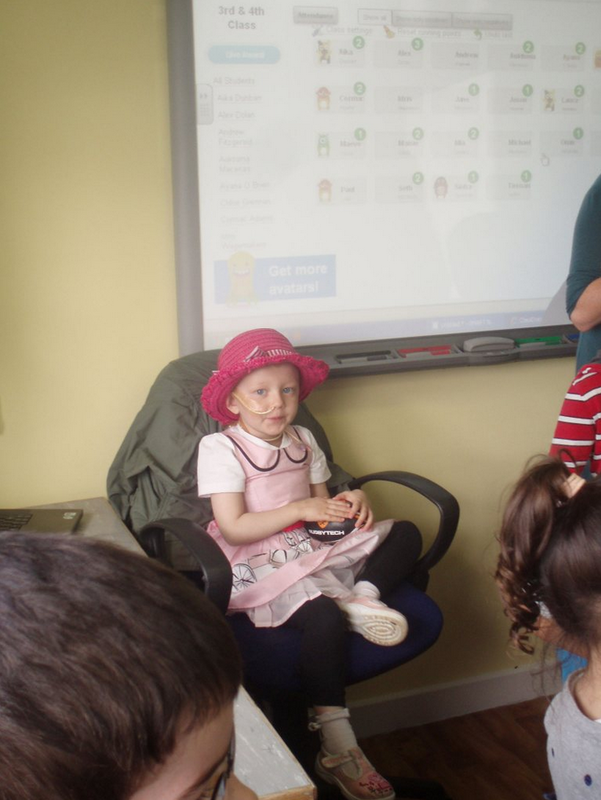 Brave Tiny Dancer Lily-Mae Morrison was given a hero’s welcome back to her desk at the Educate Together school, Claregalway last week, only days after she had undergone major treatment for a rare form of childhood cancer at Crumlin Hospital. 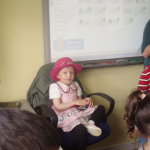 The little girl was tired but happy to be back and ensconced among her school friends and all at the school were delighted to have back the friendly child who is the subject of the fundraising song that has been topping the Pop charts here. “Lily-Mae was diagnosed with Neuroblastoma in June 2012. She is such a brave little girl and attends school when she can in between treatments. She has had recent surgery and is doing really well. “We held a fund raiser for the Sunni Mae Trust in November which raised over €500. Our school choir ‘R Tunes are learning the song Tiny Dancer,” says the principal Terri Claffey. The warm welcome accorded to Lily-Mae is typical of the caring, loving and affectionate environment that this Educate Together school accords its pupils. On the day of our visit many of the pupils were anxious to tell us how much they love going to school there. Sixth class pupils Andrew Doyla and Ciaran Hatch-Devlin spoke about the welcoming ethos that they have experienced in the school. Emma Malone who is in fifth class talked about the school teams and here love of learning music and songs. Conor Gilpin said he came there from a school in England and the atmosphere at the Educate Together school was totally different. Everyone is friendly and it is more based on “discussion and debate” according to the sixth class pupil. Another pupil from sixth class, Jack Lindey, said he was delighted to have been accepted for doing junior philosophy at NUI Galway and he goes there to study every Saturday. 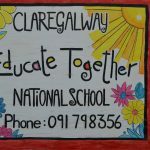 Educate Together in Claregalway has grown from a mere 29 pupils eight years ago, to its current 102, and principal Terri, who has been there since the beginning, says its numbers are set to grow even more in the coming years. The principal is delighted that the Department of Education have announced that the school will move to a new permanent building in 2015–16. Since our last visit the school has added on a modular building with two large classrooms and a support room. “We have four class rooms now and two support rooms. We also have a field adjoining the school and use it for hurling and in summer for athletics, picnics, etc,” says Terri Claffey. The Department of Education recently gave the school a glowing recommendation following a whole school evaluation. During these inspections the quality of the school management and leadership, the quality of teaching, learning and assessment, and the school’s own planning and self-review are all evaluated. Oral feedback is also available and a printed report is published on the DES website www.education.ie. “The whole school community are really proud of our school. The staff were praised for their dedication and commitment and our high standards were acknowledged,” says the principal. Everybody involved with the school was particularly pleased with one of the statements issued by the inspectors from the Department. It praised the ‘highly effective strategies that are in place to manage pupil behaviour. There is a strong emphasis on developing the pupils’ self-confidence, individuality and social conscience. ‘Pupils present are very respectful and confident in their interactions with their peers and with adults,” states the report. The very active parent group have elected new officers and renamed themselves Parents Together. They have also organised lots of events since September. These include an international night, a disco at Halloween, a parents’ night and lots of support for staff for the school’s welcome afternoon’ and big breakfast fundraiser for Lily–Mae. There is an Interactive Whiteboard in all four classrooms. Lessons are designed with input and activities using the Interactive Whiteboard. First and second classes watch the news or TG4 every day while eating their lunch. The school has a class Dojo point’s system programme, which is a hit with all ages, and children themselves love adding the points themselves. The student council and Green committee were elected in October. Both committees are busy and meet regularly. The student council recently visited the Claregalway & District Day Care Centre. They have re-started the reading club and this is an initiative, which last year’s Council began. The Green committee have already achieved three green flags in the area of waste, energy and water. They are currently working on the theme of Travel. The principal says the teaching of Irish is very important to the school. After-school activities include Hurling, Camogie, and multi-sport, spikeball, French and a Faith Formation class for Catholics. “Our Spikeball team have been playing friendlies locally for years. We enter the Galway blitz annually and play in school every day during our breaks as well as our weekly afterschool session every Wednesday,” says the principal. The pupils have gone skipping crazy since UK skipping instructor Lee visited them last year. “We had a whole day of skipping displays and even a module for parents and teachers after school. We invested in school ropes and put on a display for our sports day. “All were really enthusiastic and have learned new moves. This year we also started a homework club. It is really popular and the feedback from parents is excellent,” concluded the principal. 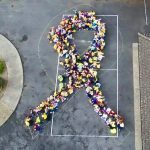 Tiny Dancer – Childhood Cancer Awareness.